A classical sociologist can be defined as someone whose works occupied a central position among the sociological ideas and notions of an era. 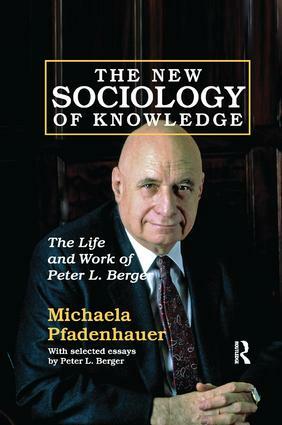 Following this criterion, Michaela Pfadenhauer demonstrates the relevance of Peter L. Berger's work to the sociology of knowledge. Pfadenhauer shows that Berger is not only a sociologist of religion, but one whose works are characterized by a sociology-of-knowledge perspective.Berger stands out among his fellow social scientists both quantitatively and qualitatively. He has written numerous books, which have been translated into many languages, and a multitude of essays in scholarly journals and popular magazines. For decades, he has played a role in shaping both public debate and social scientific discourse in America and far beyond.As a sociologist of knowledge, Berger has played three roles: he has been a theoretician of modern life, an analyst of modern religiosity, and an empiricist of global economic culture. In all areas, the focus on processes rather than status quo is characteristic of Berger's thinking. This book provides an in-depth view on the critical thinking of one of the most important sociologists that present times has to offer. It includes four written essays by Berger.